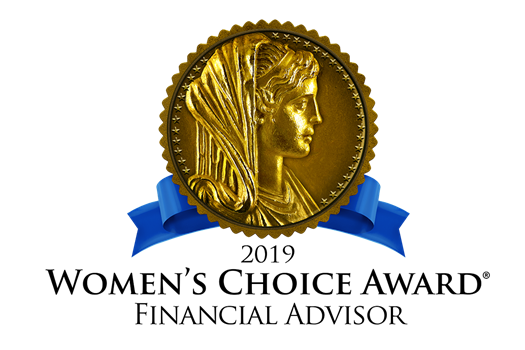 As the leading advocate for female consumers, WomenCertified Inc. is pleased to announce that for the third year in a row John Galego, president of Atlas Wealth Strategies, has received the Women’s Choice Award for Financial Advisors and Firms based on rigorous research, 17 objective criteria. The Women’s Choice Award is the only recognition program for well-qualified advisors who are committed to the women’s market and serving their female clients. At least 1/3 of their clientele are women and achieving this award reaffirms the commitment John Galego has to extraordinary service in addressing the financial needs of women and their families. WomenCertified, originator of the Women’s Choice Award, was created by Delia Passi, the leading advocate for female consumers and former group publisher of Working Woman and Working Mother magazines. Delia has created the Women’s Choice Award for Financial Advisors in an effort to help women identify those advisors who are committed to providing quality service, and cutting their time in half when searching for the right financial advisor to cater to their financial needs. The award allows this elite group of advisors to showcase their commitment to the women’s market, while giving potential clients a starting point for entrusting their finances to an advisor. John Galego has dedicated himself as a financial advocate on behalf of his clients since 2002. He founded Atlas Wealth Strategies, an independent financial services firm, to help empower clients to make educated decisions about their futures. He has particular expertise working with women on financial planning and investing, and frequently writes and speaks on financial topics for women. *** Source: Women Dominate the Global Market Place; here are 5 keys to reaching them. As seen in Boston Magazine, Five Star Professional has recognized John Galego with the 2019 Five Star Wealth Manager award. 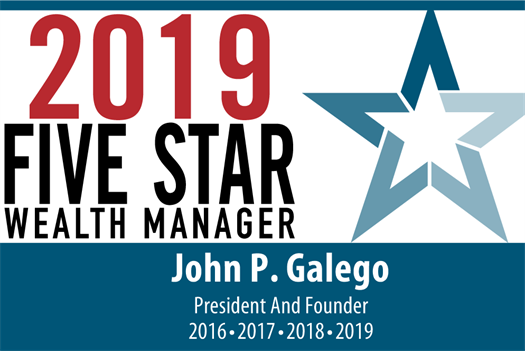 "We are pleased to announce that John Galego has won the 2019 Five Star Wealth Manager award! By earning this honor, John has demonstrated a commitment to clients. Please offer John your congratulations. 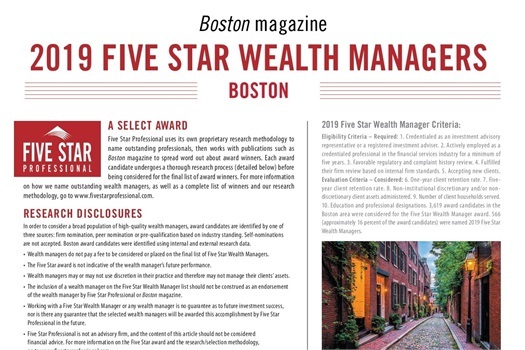 Five Star Professional has recognized in the pages of Boston magazine an outstanding group of Boston-area wealth managers.